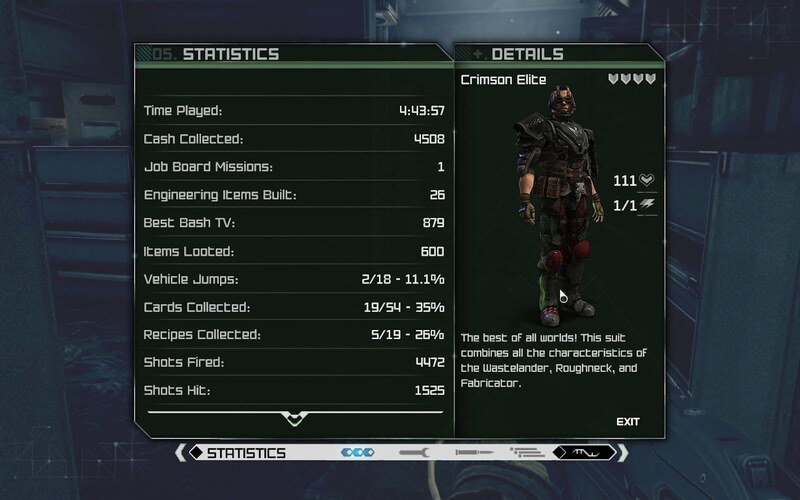 It’s been a long time since id Software developed a new game, their last effort being Quake 4 back in 2005. 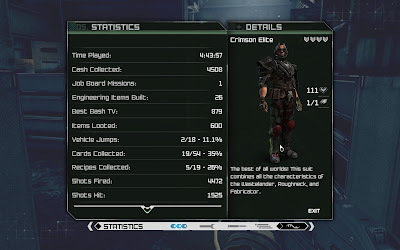 What that experience taught me is that while id Software aren’t very good at making a revolutionary game in terms of gameplay, they’re at least good at developing awesomely realistic graphics engines (and indeed, that’s where they have made a lot of their money from). When information on Rage started to trickle in, it sounded promising: They were going to allow you to explore an open world with a sci-fi post-apocalyptic setting; you’d be able to drive around in buggies and there were various quests you could go. It sounded like they were onto something. 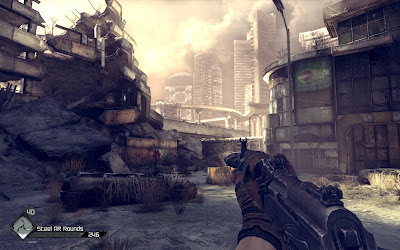 Of course, a very similar game in terms of setting was released before Rage even saw the light of day called Borderlands. 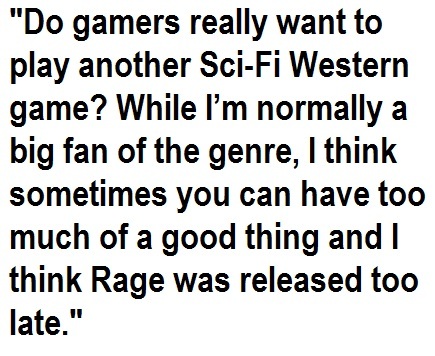 So Rage had to be particularly special if it was going to prove it was the better post-apocalyptic Sci-Fi game to play. I purchased my copy of Rage since I’m a fan of old-school developers like id. They made games that are legendary like Wolfenstein 3D, Doom, Quake, even Commander Keen. Who was to deny that id couldn’t repeat their successes of yesteryear? In Rage, you play the survivor of an asteroid impact that has turned the Earth into a barren wasteland. You awaken from stasis to find that the world is plagued by mutants and bandits. Those that aren’t mutants or bandits try to survive as best as they can, usually in small communities dotted across the wasteland. The game has a very Sci-fi Western setting, a bit like Borderlands or Fallout, which already presents a problem for Rage since frankly I think the market is already saturated with games based in these genres. In 2008, gamers fought through post-apocalyptic Washington D.C. in Fallout 3. In 2009, they fought alien creatures on the frontier world of Pandora in Borderlands. Do gamers really want to play another Sci-Fi Western game? 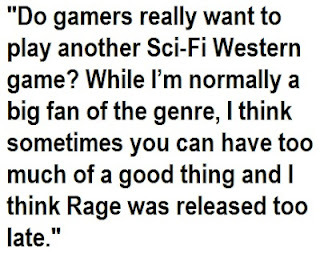 While I’m normally a big fan of the genre, I think sometimes you can have too much of a good thing and I think Rage was released too late. The best way to describe the gameplay in Borderlands is that it’s basically two games tacked together. On one hand you’ve got your typical FPS. Sure it’s got some RPG elements now since you’re actually doing quests/mission objectives and you’re also able to create tools and weapons by merging items together. However, the game at its core is an FPS and it doesn’t really change the formula much at all in this department (which is not surprising – we’re talking about id Software here). On the other hand, you’ve got an arcade racer similar to the Megarace series. You’re able to deck out your vehicle with guns and ammo, and either compete in tournaments for cash or collect on bounties by destroying bandit vehicles. While the game is fairly competent in both the FPS and racing/driving parts of the game, it’s all been done before and there’s nothing truly revolutionary. To make matters worse, there are actually other mini-games to divert your attention making you wonder what is this game trying to be? Is it trying to be the post-apocalyptic version of the Elder Scrolls? Well, I’m sorry to say that it’s far from it (Fallout 3 has already succeeded in that regard), and by trying to make the game more of an open world, id has neglected other areas. There’s nothing that truly stands out about the quality of the voice acting in the game or the audio in general. There is occasional sound stuttering but that’s about it. 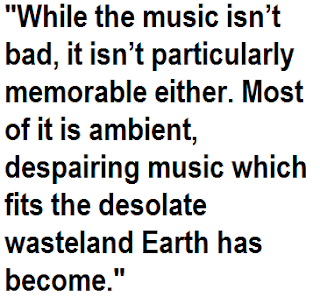 While the music isn’t bad, it isn’t particularly memorable either. Most of it is ambient, despairing music which fits the desolate wasteland Earth has become. Otherwise, you’ll hear hard rock playing while driving or Country ‘n’ Western when you’re in town. Remember when I said id Software were really good at making realistic graphics engines? You would think they’d score pretty high in this section then wouldn’t you? Unfortunately something went wrong, seriously wrong. Sure id Software did do some neat things with the engine like having things being textured on the fly, however this was very noticeable when the game first came out because the game wasn’t taking full advantage of the PC’s ability over console (that’s right, once again PC gamers suffer because of a console port). The game still ran pretty slow though in terms of framerates, which is when I discovered there was a performance driver developed by AMD/ATI *especially* for Rage. Thankfully this patch seemed to increase the framerate however shortly after this occurred I started seeing artefacts on my screen. I also couldn’t play Cities in Motion since the performance driver didn’t play ball with it at all. Eventually I just gave up playing altogether since I was investing ridiculous amounts of time just trying to get the graphics in the game running smoothly and without artefacts. I don’t know if it’s some conspiracy against AMD/ATI card owners but it’s definitely not very choice! Graphics card problems aside, I still don’t rate the game’s graphics highly. The character models aren’t that realistic, looking a bit like Borderlands except without the cel shading. 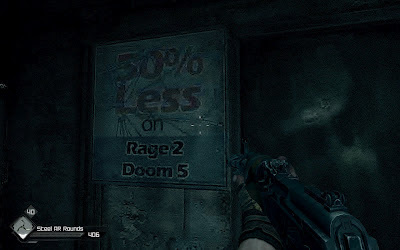 There are several mini-games and quests to play in Rage, which I suppose is better than previous id games when it comes to replay potential – you’re even able to hunt for Steam achievements by doing so. However, the main storyline (at least from what I’ve played) is rather linear and involves rather monotonous quests which involve lots of violence. The game was really buggy. So much so that I eventually gave up playing and I don’t usually admit defeat when trying to get a game to work, especially one I plan to review. I hate reviewing half-finished games but sadly folks, that’s all you’ll get with this one. As mentioned the major issue was the graphics, to the point that I couldn’t actually see what was happening on my screen thanks to the sheer number of artefacts on the screen. 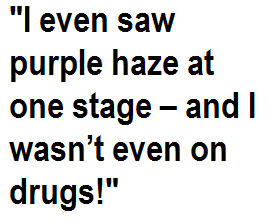 I even saw purple haze at one stage – and I wasn’t even on drugs! A buggy, boring, disappointing mess of a game. The only rage I feel is for buying this game in the first place!